Google's Director of Public Policy, Johanna Shelton, far outstrips her peers in terms of White House access. Shelton met with White House officials 128 times during the Obama administration. The next most frequent visitor, Alissa Fox of Blue Cross/Blue Shield, meet with White House officials only 75 times. 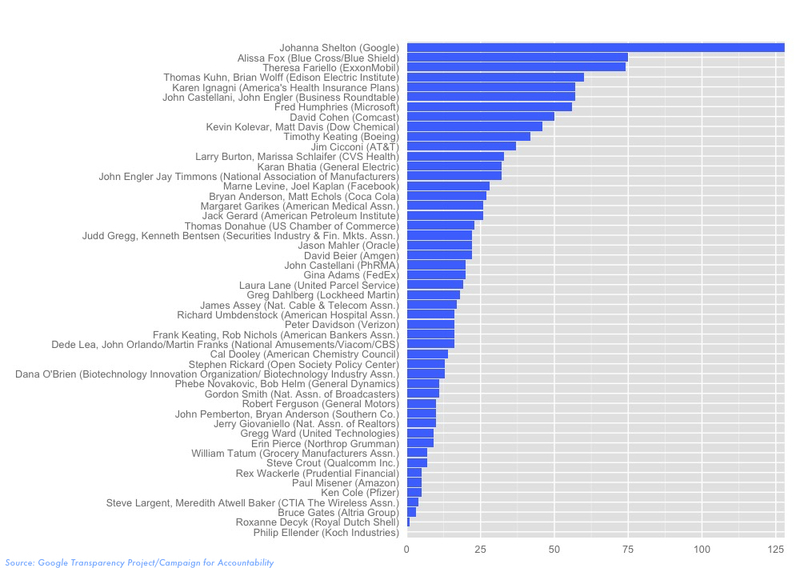 The Google Transparency Project identified top policy officials for the 50 biggest lobbying spenders,i and counted how many times each appeared in the White House visitor logs.ii This analysis shows that Google enjoys unique access to the highest echelons of government. No other tech or telecommunications firm approaches Google's level of access. Shelton met with White House officials more frequently than her counterparts at Comcast, Facebook, Amazon, Oracle, and Verizon combined. White House logs are not available for prior administrations, but Google's influence appears unprecedented. In 2007, a document listing meetings of the Bush administration's Energy Task Force revealed that White House officials held at least 40 meetings with energy industry officials.iiiThose 40 meetings pale in comparison to Shelton's 94 substantive White House visits. Even so, the Bush Administration viewed the release of Task Force records as so damaging that they went to court to keep them private. Like its predecessor, the Obama administration also meets frequently with the energy industry, but Shelton visited the White House at least 54 more times than the top representative of any energy or extractive firm. Top lobbyists' activities serve as a bellweather for their employers' level of influence in Government. Visitor access records for these 50 political influencers make clear that Google's access to the White House is unique among corporations and industry associations. Shelton's visits were just the tip of the iceberg. The Google Transparency Project found a total of 427 White House meetings involving employees of Google or related firms — more than one a week for the Obama administration.